Five nights accommodation. See accommodation section for more details. Easy / Medium – All locations within half a mile from the car, some much closer. Some slippery rocks near waterfalls and the odd uphill section present. A reasonable level of fitness and mobility is required. 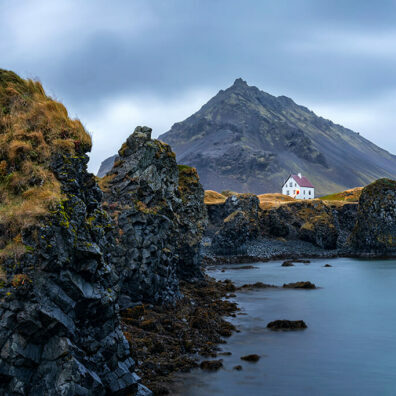 Join me on this once in a lifetime opportunity to experience the amazing landscape that is Iceland. I am so fortunate to have visited many amazing places in the world, but there is nowhere quite like the ‘land of fire and ice’. 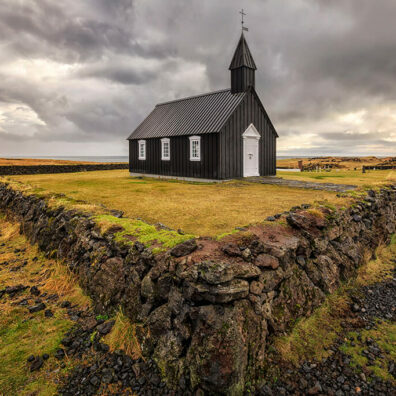 You will start your five day journey after being collected at Keflavik airport at 4pm before visiting many of the most iconic locations Iceland has to offer including the stunning sea stacks at Vik, the impressive mountain of Kirkjufell (Game of Thrones), the beautiful churches of Budir, Ingjaldshólskirkja and Vik. 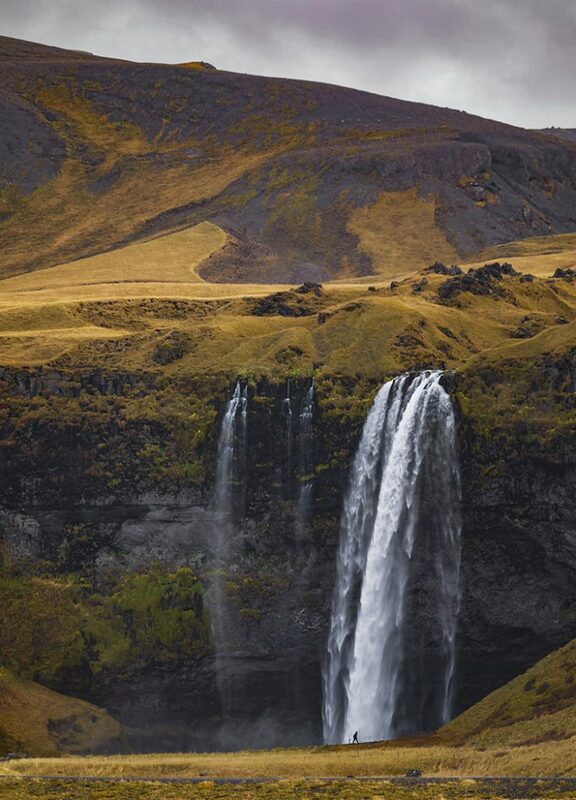 Not to forget the mighty 200ft waterfalls of Skógafoss and Seljalandsfoss as well as a few hidden gems along the way. 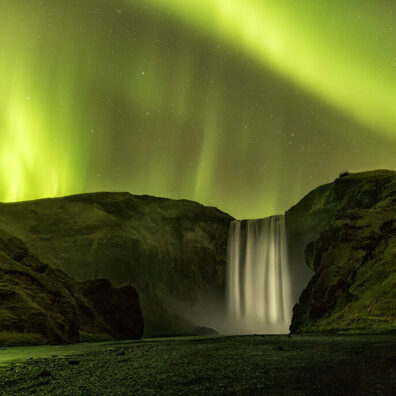 There will also be a couple of opportunities to stop en-route to capture those wonderful fleeting moments of magic as and when they happen and of course should the truly stunning aurora borealis decide to put on a fantastic show, we will be there in the evenings to capture the phenomenon otherwise known as the northern lights. 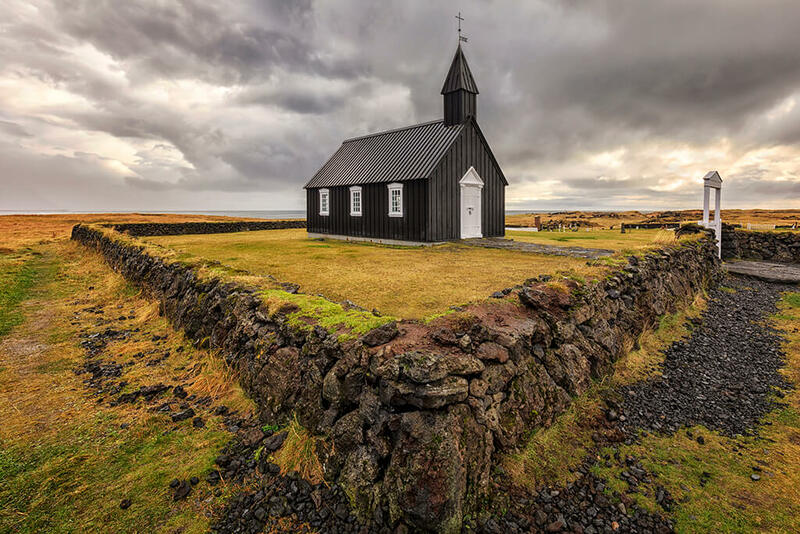 If you have always wanted to visit Iceland, this workshop in the month of late October will offer you a fantastic opportunity to enjoy the country without having to brave the harsh, cold winter weather. This will be the workshop to create long lasting memories. I hope you can join me. There are just six, twin room share places available ensuring a small, informal group with plenty of personalised 1-2-1 tuition on offer. Here is a detailed itinerary outlining our schedule although the final decision on the locations visited will be taken depending on the weather and light as well as the safety of the group. I land into Keflavik airport at 2.50pm, collect the nine seater minibus (so plenty of space for luggage, clothing and camera equipment) and collect the six workshop attendees at 4pm from the airport before heading to our 4 star, four bedroom home on the Snaefellsnes Peninsula (2 hrs, 45 minute journey) for the first three evenings. 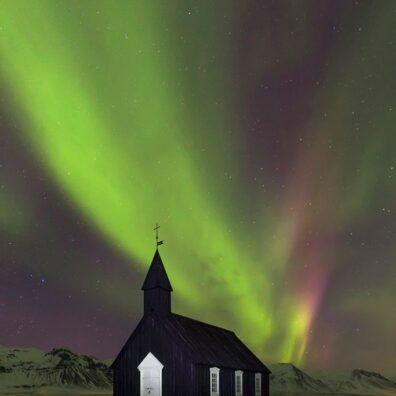 If the northern lights happen to show, we are perfectly placed to drive to the iconic black and white Búdir Church or the world famous Kirkjufell mountain and waterfalls and capture it with the magical colours behind it. 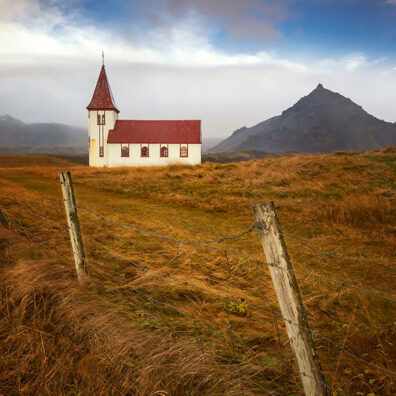 The day starts with breakfast at the house (self-catering) before heading out pre-dawn to photograph the Budir Church followed by a short drive westward to the little fishing village of Arnarstapi. The harbour, fishing boats, sea cliffs, the huge sea arch and the lone white house with the 1,500ft Mt Stapafell volcanic mountain behind it are all on offer. 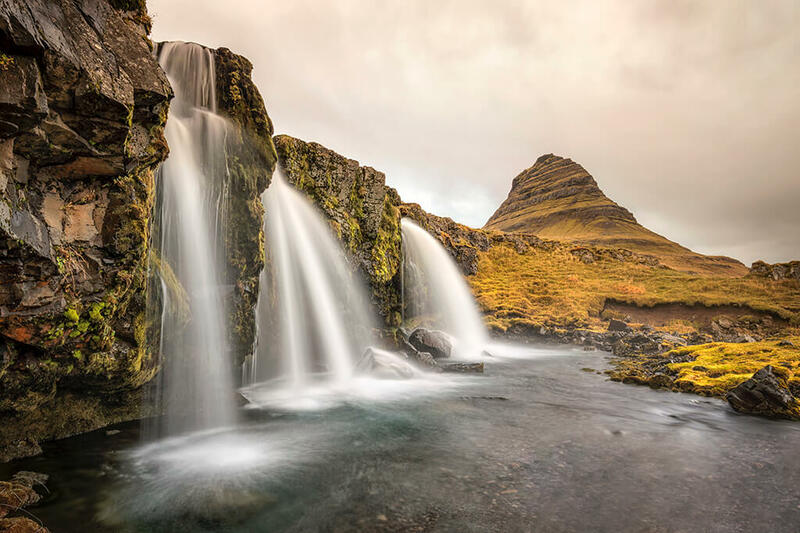 We will take lunch in Arnarstapi before venturing off to the iconic and world famous Kirkjufell mountain and Kirkjufellsfoss waterfalls (‘foss ‘meaning waterfall) for a sunset session and hopefully a display of the northern lights. 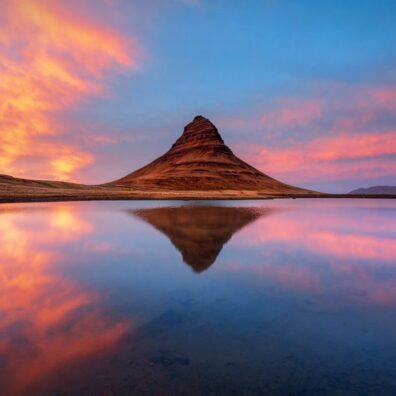 This mountain’s nickname is the ‘Witch’s Hat’ owing to its shape. 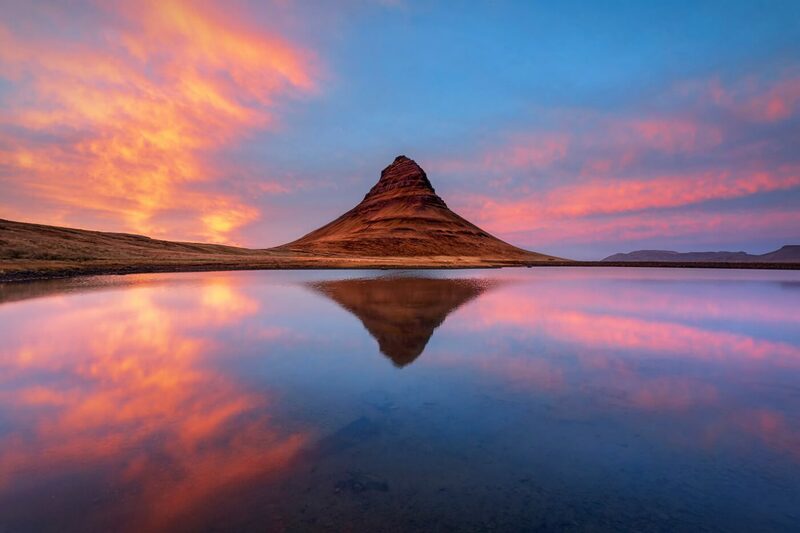 Kirkjufell is best known for its starring role in the Game of Thrones (season six). The waterfalls in the foreground with the mountain in the background provide one of the most memorable images you’ll capture on this workshop. Back to the house for our evening meal and good conversation about the day’s experiences. Today will have us spend the entire day travelling and photographing more amazing locations on the Snaefellsnes Peninsula. 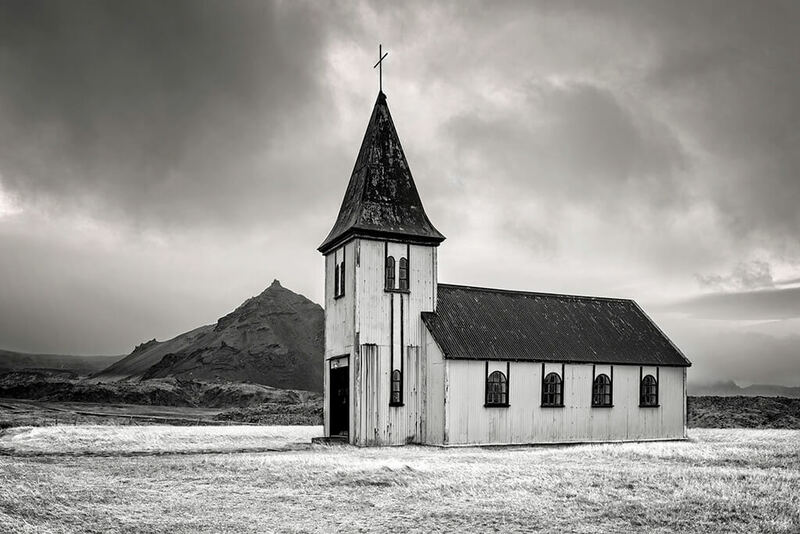 Our first location is the lovely old red and white wooden church at Hellnar. 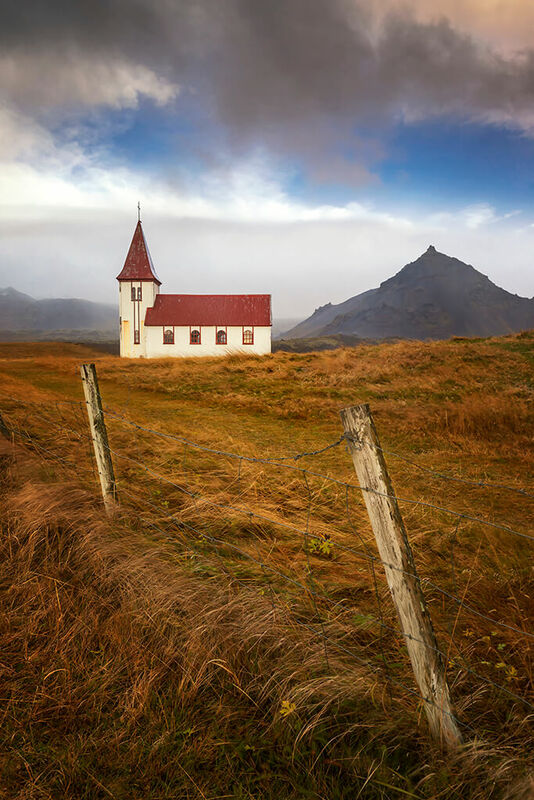 Wooden churches are so photogenic in Iceland with each one looking different to the next. 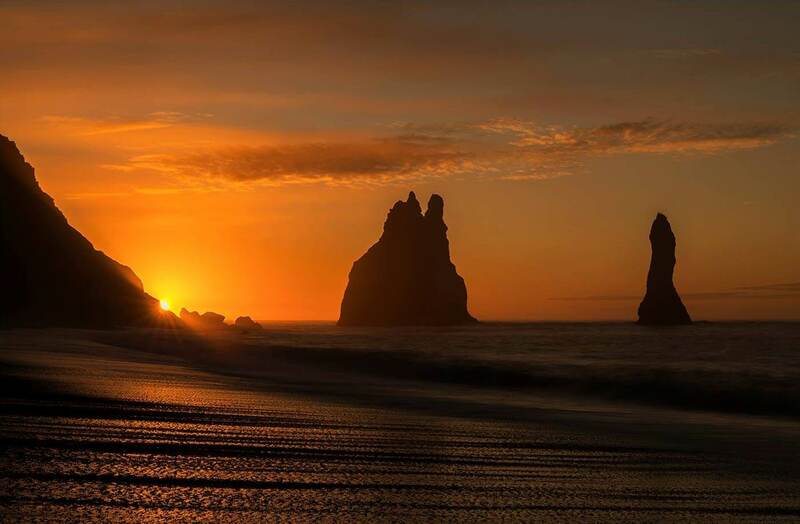 Then just a couple of minutes down the road we visit Londrangar which is an impressive pair of volcanic basalt rock pinnacles by the sea. Early afternoon and Ingjaldshólskirkja Church is next on our list. With high mountains behind it and a long road taking you up to its front door, it makes a wonderful scene to photograph. Our fourth destination is the emergency mountain hut positioned high up on a mountain pass on Route 54. This red roofed triangular hut stands proud among the surrounding mountains. I also have a couple of hidden gems for you all throughout the day too. 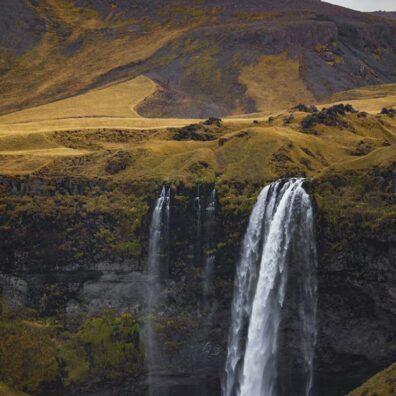 Today we head south-east to experience the majesty of the 200ft waterfalls of Seljalandsfoss and its nearby neighbour Skogafoss. Both these waterfalls are hugely impressive and for different reasons. Seljalandsfoss allows you to walk behind it and experience the power of the huge volume of water that thunders in front of you. 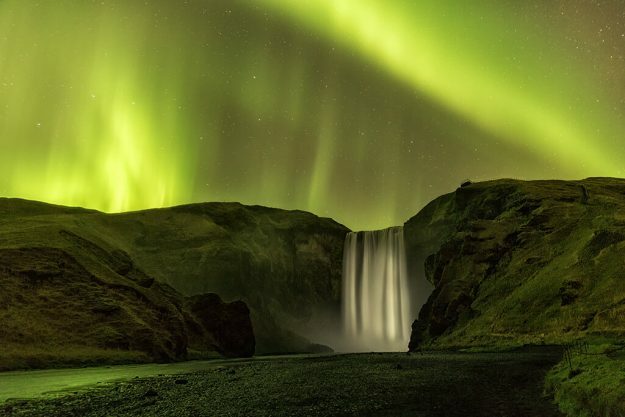 Skogafoss allows you to climb up some steps to reach the top giving you an unparalleled view of the waterfall. Lunch at Skogafoss cafe to follow before moving onto the black volcanic sandy beach of Reynisdrangar from which we will photograph the impressive sea stacks at sunset. This will be our final destination for the day before checking into the nearby newly built and launched Kria Hotel complete with its own restaurant. After our meal in the restaurant, if the northern lights are visible, we will head out to photograph them. 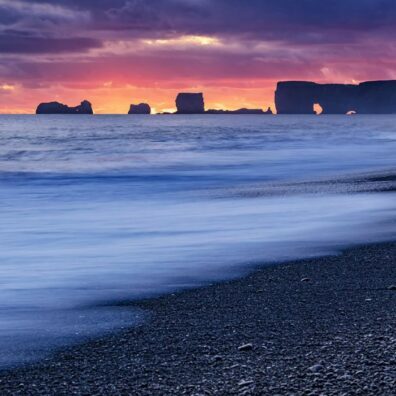 We have a choice of locations including the nearby sea stacks and of course Skogafoss. 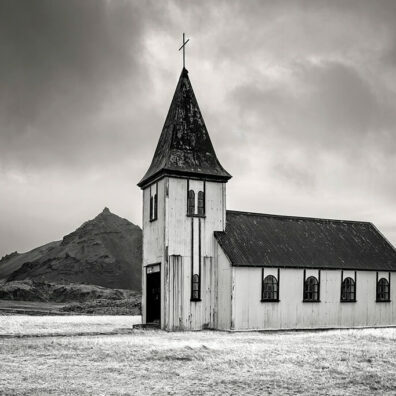 Before we take breakfast in the hotel, we will start the day by capturing the church at Vik pre-dawn (across the road from the hotel). 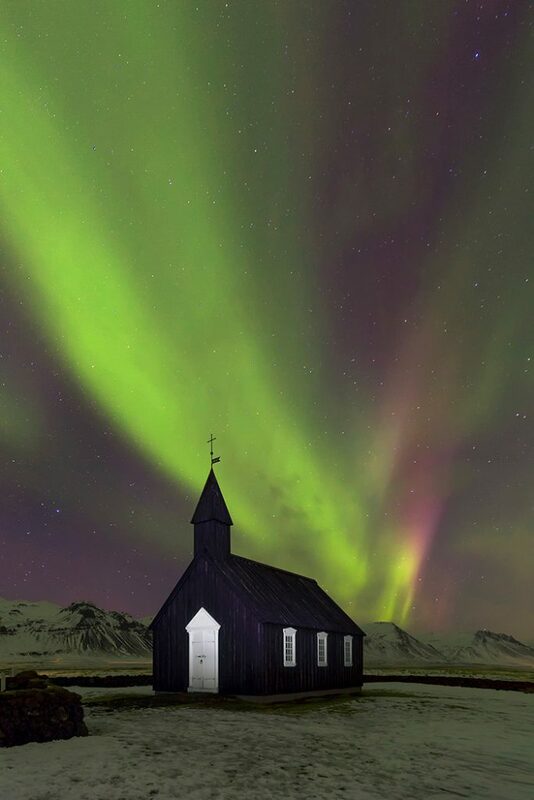 The church is lit up and set against a stunning mountain backdrop. 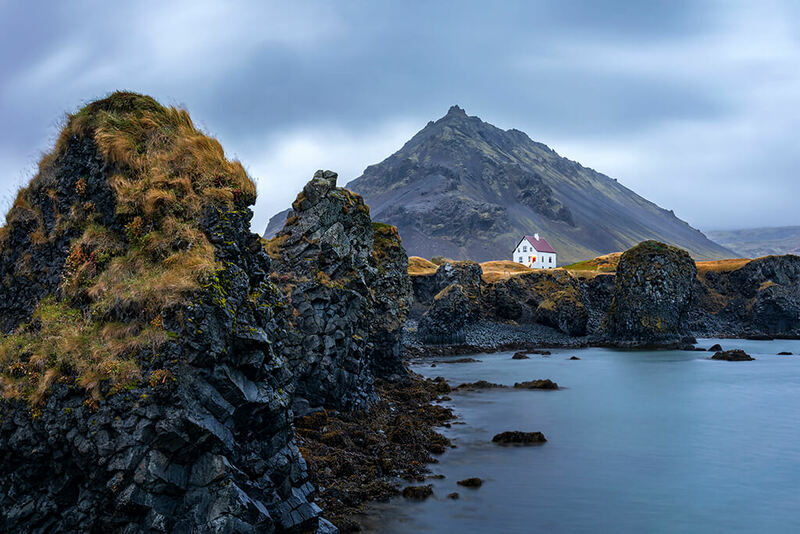 Breakfast in the hotel (included) to follow before visiting the beautiful black sandy volcanic beach of Reynisfjara is a must, where we will be photographing the beach, the basalt rock columns and the iconic sea stacks. 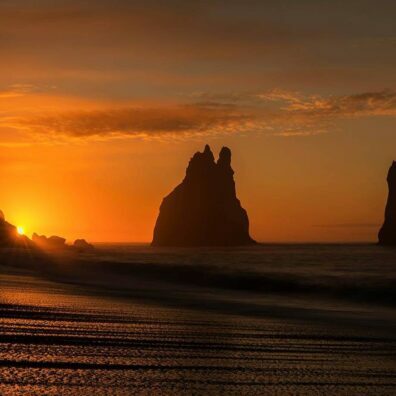 Late morning and we’re on the road again to visit the west side of Reynisfjara from the towering cliffs of Dyrhólaey. 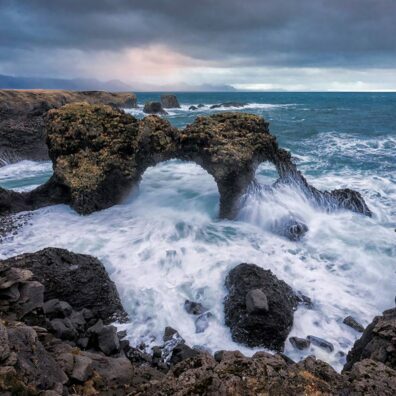 From here you will photograph the sea stacks and a sea arch on the beaches from high up on the edge of the cliffs. This really is a spectacular place to spend an hour or so. 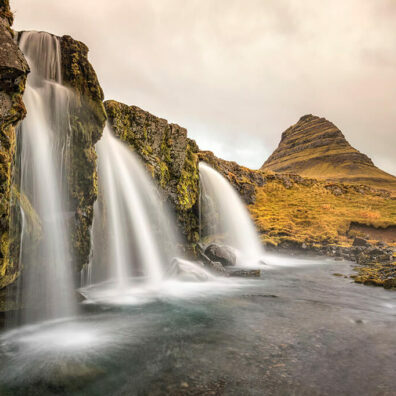 Lunch to follow en-route to the gorgeous little known, gorge located Kvernufoss waterfall before heading westwards to our final destination Keflavik which we see us settle into our boutique hotel, don our swimming attire and take a dip in the heated first floor outdoor pool. A meal at the harbourside Kaffi Duus restaurant will finish off a spectacular five days in this stunning country. It is an early 8am flight home to reflect on what will be a trip of a lifetime. If you have always promised yourself a photography holiday of a lifetime, this one will take some beating. I hope you can join me. Flights are not included in the workshop price and the typical cost is between £200/£300 from Manchester to Keflavik including a 10kg cabin and 23kg hold luggage allowance. I am flying with Icelandair. My flight details are below. 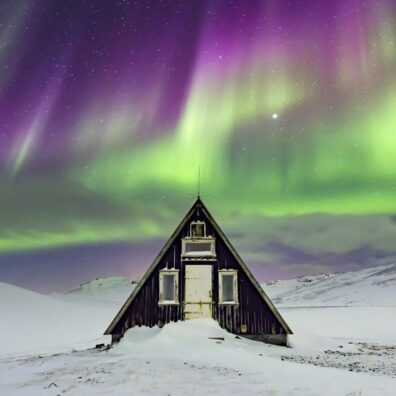 There are three different types of accommodation during our five nights in Iceland, the first one a four bedroom shared house, then two hotels. See below for more information and a clickable link to the websites. Three nights in a beautifully appointed, spacious, recently renovated four bedroom house. Shared twin rooms with two shared bathrooms available. Self catering. One nights in a stunning, recently built hotel complete with restaurant. Shared spacious twin rooms with en-suite bathrooms (option to upgrade to your own room available for an extra £80. Contact me for details) Breakfast included. Evening meal in the hotel’s restaurant not included. One night shared twin rooms with en-suite bathrooms (option to upgrade to your own room available for an extra £65. Contact me for details). Boutique hotel including a rooftop outdoor heated pool. Meals not included. Our mode of transport for this workshop will a nine-seater 4×4 minibus. This will ensure that there is plenty of space for us all including luggage, clothing and camera equipment. The Iceland Workshop was both exciting and disappointing but not due to Melvin’s fault. We had extremely difficult weather conditions resulting in white-out blizzards, high winds, road closures and deep snow which resulted in less opportunities for photography which was, of course, the reason for the trip. Bad timing. But I decided early on to just enjoy the trip regardless and experience Iceland without worrying too much about photography. Melvin handled the rough weather conditions like a pro. He provided a comfortable, safe Mercedes 4WD vehicle for our group and while we drove through some scary weather conditions, I never once felt unsafe. Melvin was always cheerful and confident. 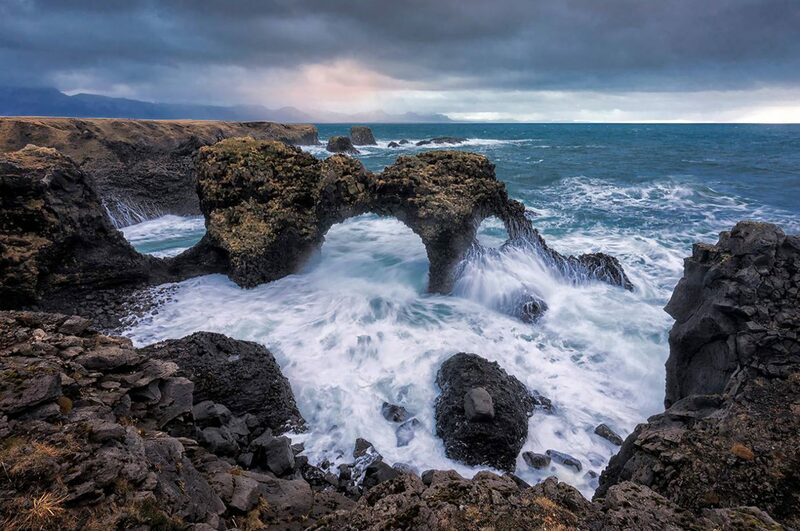 We went to most of the Iceland photo icons and a few off the usual course. I was satisfied with most of my images. What I did appreciate was Melvin’s professional attention to detail and his ability to make amendments to the itinerary when the original plans failed due to road closings. We continued our journey with nice substitute lodging. I was very pleased with the accommodations that Melvin chose for our group and the food was good, too. I know that the challenging weather conditions and driving in them with us under his care must have been stressful for Melvin, but I never heard him complain once and he was always exceedingly cheerful. I definitely recommend the Iceland trip with Melvin! I joined Melvin for his workshop to Iceland during October 2017. Had a great time on the trip visiting glaciers, waterfalls, black sand beaches, beautiful churches and mountains to name a few locations. Melvin was excellent at sharing his knowledge and kept his sense of humour throughout the journey. We stayed in excellent accommodation with good food. 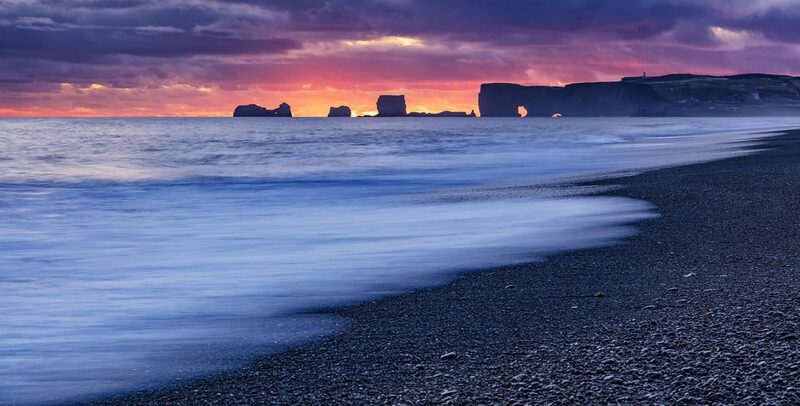 Iceland is a place which once visited calls you back again and again. It didn’t disappoint on this visit. Would I go on another workshop with Melvin? Of course I would! !